Walk from RET subway station ‘Dijkzigt‘ to entrance to enter Erasmus MC. 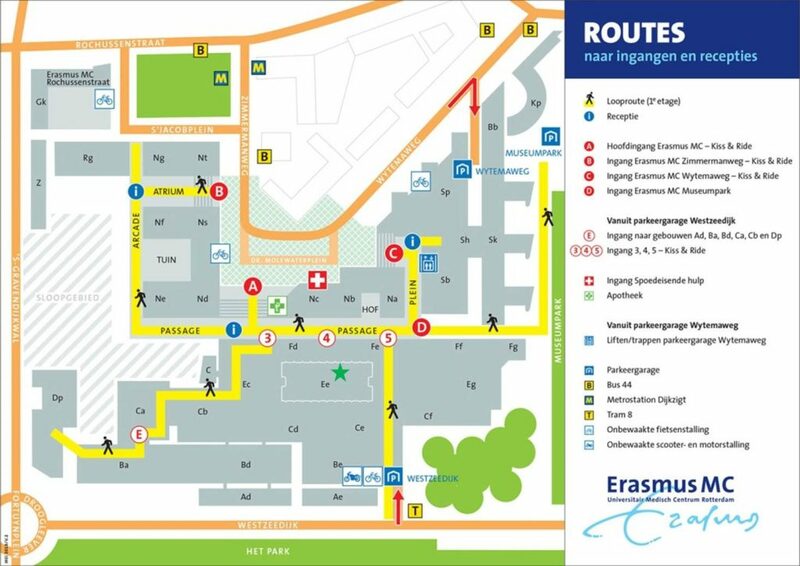 Park your car in the ‘Museumpark’ parking lot and take entrance to enter Erasmus MC. Walk through the large hall (‘Passage’) to the white staircases near in front of the AH-to-go shop. Take the steps or elevator to the 3rd floor of the Ee building and check in with the receptionist; you will be provided with a visitor’s badge. The location of the lab is indicated by the green asterisk on the map. Attn. Dr. Jeroen Demmers (phone # 010-7038124) it is important to include this phone number on the address label!